Jeff MacNabb received his B.Sc. from Guelph University in 1988 and started work in video production in 1989 as a cameraman. 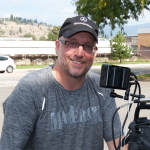 He started Maverick in 1993 and is experienced in all aspects of media production.